Shizuoka Prefecture (静岡県, Shizuoka-ken) is a prefecture in the Chūbu region of Japan on the island of Honshu. The capital is the city of Shizuoka. Shizuoka prefecture was formed from the former Tōtōmi Province, Suruga Province and Izu Province provinces. Shizuoka is on the east coast of Honshu facing the Pacific Ocean. 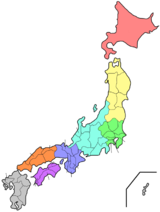 The prefecture is bordered on the west by Aichi Prefecture and Nagano Prefecture. The northern borders of Shuzuoka are shared with Yamanashi Prefecture and Kanagawa Prefecture. Mount Fuji is on the northern border of Shizuoka. Suruga Bay is its main coastal feature. The Izu Peninsula forms the eastern side of the bay. Throughout history, every 100 to 150 years, an earthquake of disastrous proportions called the Tokai Earthquake has hit Shizuoka. ↑ Nussbaum, Louis-Frédéric. (2005). "Shizuoka-ken" in Japan Encyclopedia, p. 876; "Chūbu" at p. 126. ↑ 2.0 2.1 2.2 2.3 Nussbaum, "Shizuoka" at p. 876. ↑ "Japan's Prime Minister Shuts Nuclear Plant in Earthquake Danger Zone," Environmental News Service, May 6, 2011; retrieved 2011-11-28. This page was last changed on 12 March 2013, at 00:17.